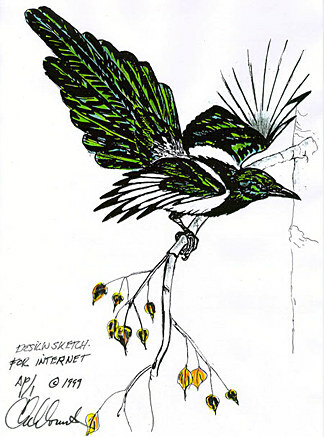 My latest pre-cast offering is the Magpie in an aspen branch titled "Fall Colors". It has been my policy to offer a pre-cast offering to my clients on any new work that I am working on but that has not gone to publication. These pieces are offered at the lowest possible prices for the work. The sales of these pieces keeps me busy doing new work and allows the adventuresome client the opportunity to get the best possible prices for their money. Once the piece is published the prices go to another level and pieces are sold only at that market price. For the buyer who looks at their art as an investment this is an ideal way to buy. My work has been growing steadily in value in the market place for thirty-five years. For investors appraisals of past works, which are now sold out editions, are available upon request. I published "Nuptial Finery" in 1994 and the pre-cast offering was $3,200.00 this piece is now a sold out edition with only my personal copy available for sale at $10,000.00. I was commissioned to do this piece by a local art dealer in the Denver market. He suggested that in addition to making this piece suitable for hanging on the wall I make a bracket so that it can be hung in the corner of a room. Which is a space that is rarely hung with art. He came up with this idea and frankly I would have never thought of it. I think it is a novel idea and I will be engineering the bracket along with the sculpture. If you think you might want take advantage of the pre-cast offer I'll throw in the corner bracket as a freebee. I feel this piece will be another slight stretch for my artistic skills. It will be a combination of a jet black patina with rainbow colored iridescence with white gold leafing to do the white colors on the bird and different colored yellow gold leafing to do the aspen leaves. These are all techniques, which I have used in other sculptures but that I have never really combined within a major piece. I'm excited to be doing this bird which I have all over my backyard here in Colorado. So the live models show up whenever I feed them. The first copy, an artists proof, is going to be reserved by the party who commissioned the work. The series is an edition of twenty pieces with two artists Proofs one for the art dealer and one for myself. Let me know what your interest level is for owning this sculpture. I will be posting to the Internet additional information on the piece as the clay model is being finished. To place an order contact us inquiries07@artsales.com and an individual sales representative will contact you assist you with the transaction.